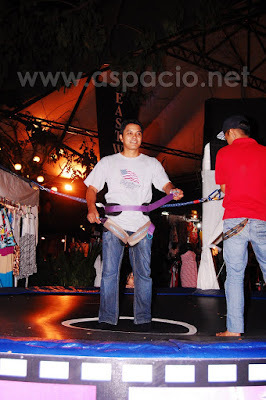 Last Friday, before having dinner with other bloggers, I had the chance of trying out the new Bungee Fun at the Eastwood City. At first I thought it would be bungee jumping and then when I saw that it wasn't I felt that I got my hopes up a bit. 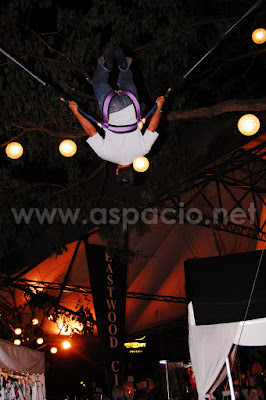 Eastwood City's Bungee Fun did look less challenging than bungee jumping but it wasn't as easy as pie either. It wasn't too hard that kids even tried it. It looked simple and easy until I tried it. I like daring activities like this one. So I took on the challenge and allowed myself to be strapped in. 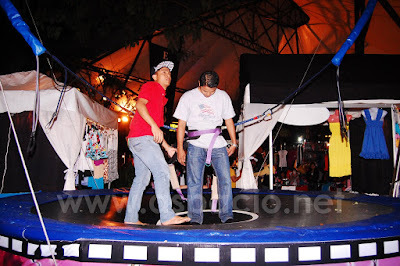 The photo above shows the straps being tightened, making the Bungee Fun safe for anyone. 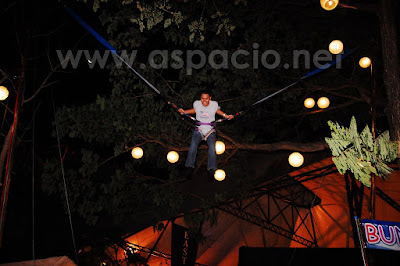 When I was all set, I started jumping and tried using the power from the big trampoline. The lines connected to my waist also helped and pulled me up, allowing me to leap to about 20 feet from the trampoline. With a leap that high I thought I would be able to do anything. So I attempted a back flip. At first try I wasn't able to land on my feet. But I immediately found success on my next attempt. So I proceeded to try a somersault. Again, at first, I wasn't able to successfully do a full turn. But as tried and tried the more I got the hang of it and eventually was able to do a back-to-back somersault and backflip. And it was not easy as pie! Because at the same moment I succeeded in my attempts at acrobatics I also felt exhaustion. So I just tried to rest and jumped as high as I was able to reach. Eventually, I asked the man in charge to slacken the ropes because I was tired and needed to stop. As I got off the Bungee Fun's trampoline I felt soreness in my calf muscles and hands, probably for being tense all through out the routine on the trampoline. When I got in the car and started to turn the car's steering wheel I felt other arm and shoulder muscles that were sore. 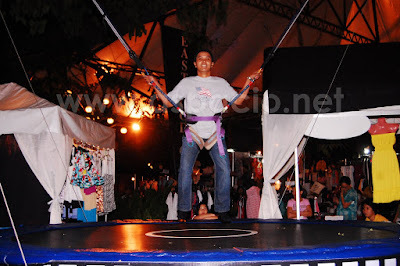 So the Bungee Fun really isn't that easy when you try some acrobatics on it. Other kids and some ladies tried it, too, after I got off. 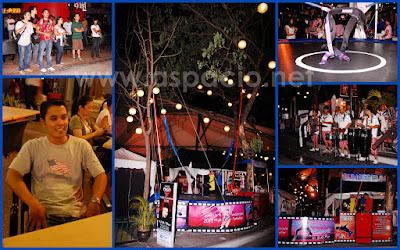 Over all, it is a great addition to Eastwood City's entertainment offers. 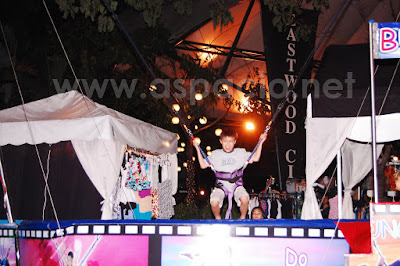 For P120 anyone can try the Bungee Fun at Eastwood City - men who want to be dared, ladies who want to overcome their fear and kids who want to enjoy this safe and new entertainment at Eastwood City. 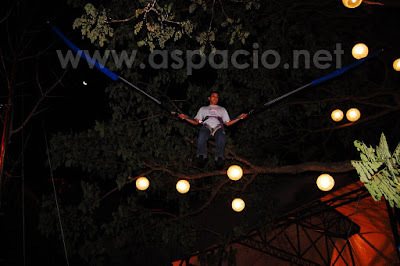 The Bungee Fun is located in front of Pho Hoa, beside Dulcinea Eastwood City. No way would I even try this! I'm sure it was fun though. looks like easy.. hmm.. i'm not a daredevil but given the chance (and the right time and place), i would love to try bungee jumping one day..